Yesterday, I decided to experiment with a new pb cookie recipe. I just had to decide what to use instead of flour… In fact, my first thought was to re-make the coconut flour mini chocolate cupcakes as peanut butter cupcakes. But I wanted a break from the coconut flour (how many coconut flour flatbread grilled cheese sandwiches do you think one person should eat in one week?!). In the end, I decided to sub in peanut butter powder, and I’m glad I did. I buy this product in Wegmans. I'm not sure how common it is, but I found it online too. It's like peanut flour, so you could sub that in...just keep in mind if you decide to use a different product, the texture might be slightly different and you'll probably have to adjust the amount of sweetener! First, cream butter, sugar, and peanut butter with a mixer (I used my stand mixer and made sure to put it on high each time I added something). Add unbeaten eggs and honey. Add flour, soda, and salt. Taste the dough, and add more honey or sugar if you think you need it. Keep in mind, the vanilla cream is going to be quite sweet. These cookies, when the recipe is followed exactly, are only subtly sweet. Roll into balls and smoosh with a fork. Bake at 325 degrees for 11-12 minutes. Let the cookies cool on the baking pan for several minutes (or they do not maintain their shape!). Make sure to not over bake. The bottom of the cookies should not be darkened. Pre-baked cookies---they did expand a little bit, so I left just barely enough room between them on the pan. Soft, but not chewy. Just what I was looking for! I over-baked one batch by 2 minutes...I think the magic time for baking is 11-12 minutes. The bottoms were not dark at all in the batch that turned out perfectly! I rarely eat a peanut butter cookie by itself—they should be consumed with something as a complement! Vanilla cream---you can adjust the amount of sweetness to taste. 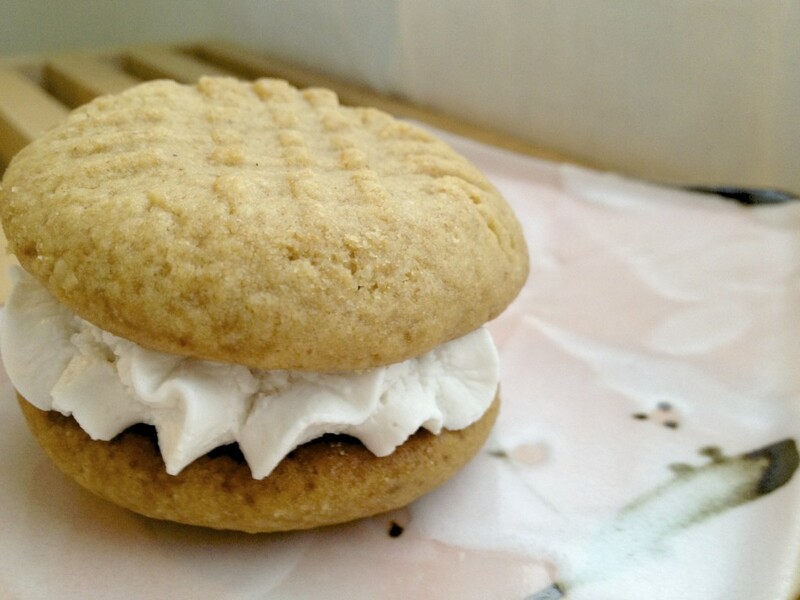 Since the cookies are not super sweet, the cream being sweeter was a great complement! 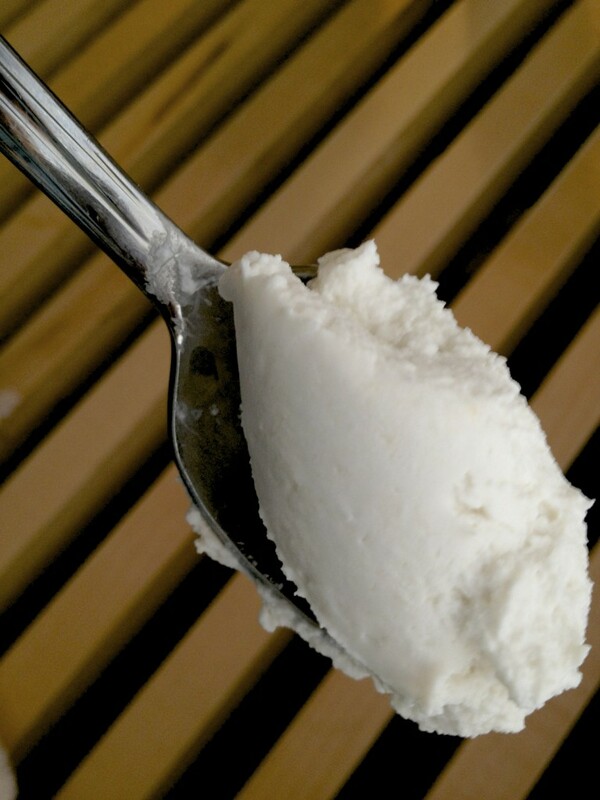 1 container coconut cream, refrigerated with the excess liquid poured off before using (refrigerate for several hours and open from the “light” weight end of the container). I use Wilderness Family Naturals 8.45 ounce container, but you can use an 8 ounce can too. Use a hand mixer to blend until smooth. Pipe or scoop onto one cookie and press another one on top to make a sandwich. 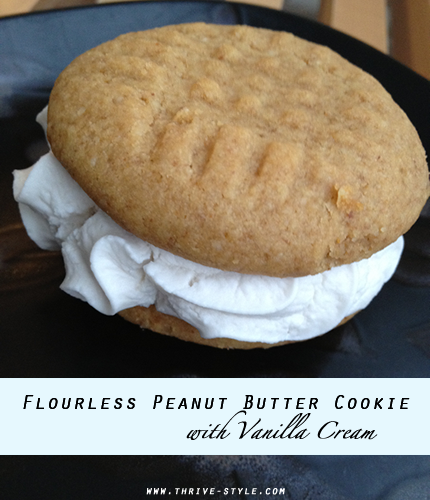 This isn't a very big snack, but it's very rich and peanut buttery...and satisfying! Full disclosure: This was my lunch today. I made a travel snack kit to deliver to my Mom's house---I've learned to keep the "parts" of a snack separate until just before assembly. 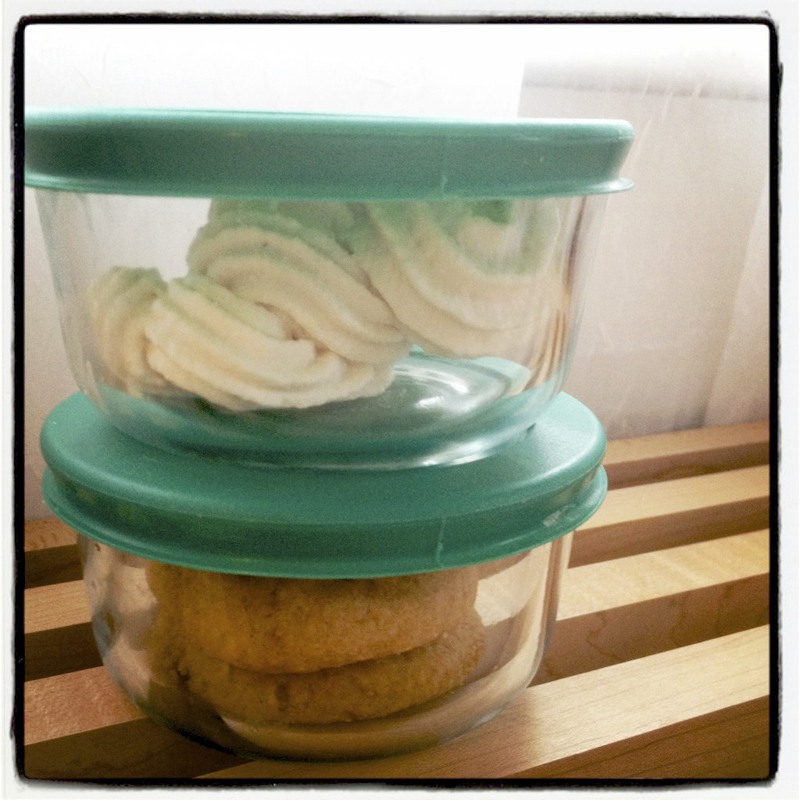 The cream will be refrigerated and the cookies won't---and I think that's how it should be! 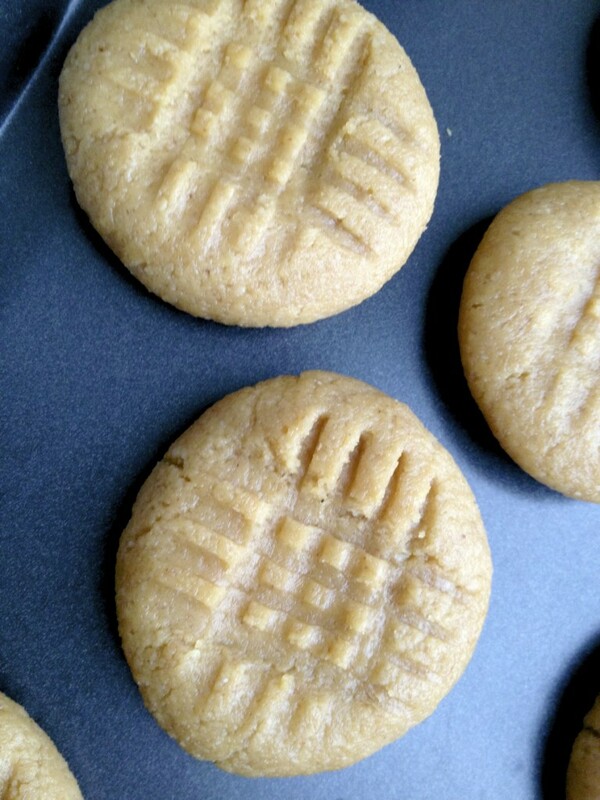 Are you a peanut butter cookie fan? I never was in school–the pb cookies were so chewy (I’m all for a chewy chocolate chip cookie, but not peanut butter!). Peanut butter cookies, especially this one with pb and pb powder, are very rich and go great with ….Vanilla cream and a cup of coffee! How is your week? What have you made up in the kitchen lately?! Tomorrow I’m keeping my fingers crossed for a snow day — these would be AMAZING to make! I wonder if it would work w/ almond flour and almond butter…hm…must experiment! I am so making those cookies!! Wow, these look amazing! We are definitely a peanut butter cookie family here! I made a peanut butter cream in the center of mine sometimes. I keep a stock of peanut flour here, so these are a must try! Now I need to find time in the kitchen! we will have to try these out with another nut butter as we do not due peanuts, but they sound great! I started using stevia in my smoothies and like it. Next I want to try ZSweet or Xylitol in my baking. Wow… yes please to one of those right now!! Yum! 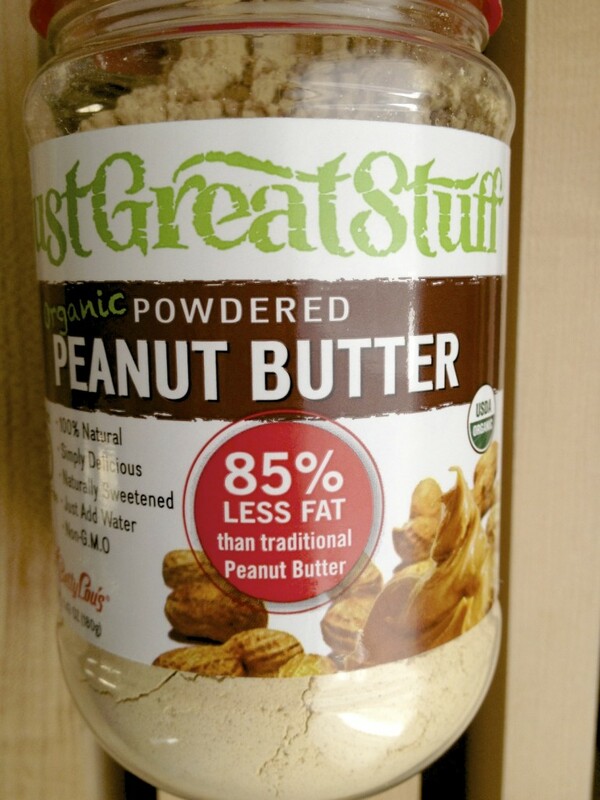 I have never seen PB powder…the closest I can think of is almond meal at Trader Joe’s. Sounds really good though! I need to try these, as they look delicious! But doesn’t butter count as dairy? Mmm, I’ll have to see if they have PB powder at Wegmans near me! Nothing beats a good chocolate chip cookie, but I love peanut butter cookies, too. Actually I love pretty much anything with peanut butter. I was also thinking a peanut butter cream would be awesome in these, too. Your sadwich cookies are too cute!! When I saw the cookies yesterday, I was hoping they would be peanut butter. I can’t wait to try them! So pretty! Totally just pinned that. 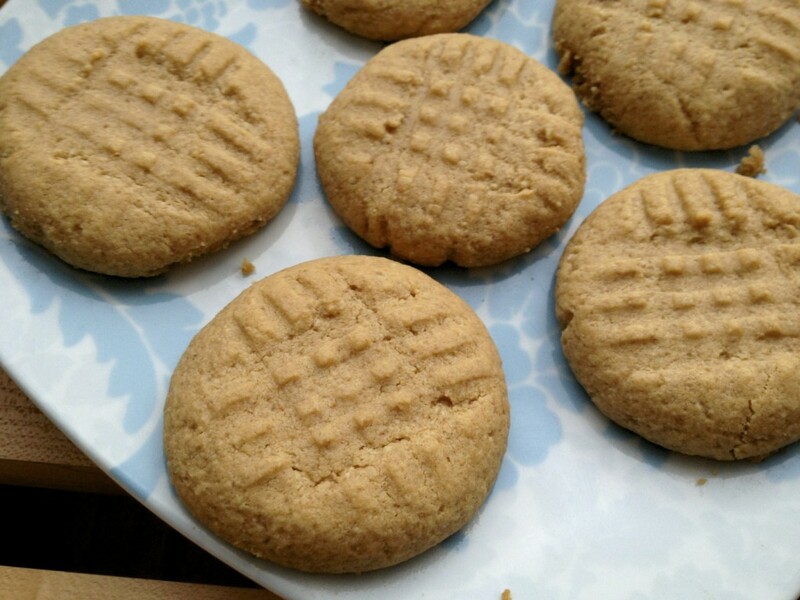 Peanut butter cookies are my favorite, and I love that this recipe includes butter and eggs (essential to cookies, in my mind!) I might try these with a square of dark chocolate as a centerpiece. Oh yes, a cookie is only a cookie with butter and eggs! My first thought for these was to do chocolate cream (I was either going to use coconut cream or avocado as the base for it)—but for some reason went with vanilla…which tastes great, but I think chocolate in any form would be fabulous! Nope. Butter is not technically classified as dairy—it’s just the fat out of the dairy. But some people call it dairy anyway (i.e. The government lumped eggs and butter with dairy at some point, but neither of them technically are dairy). Doctors do it sometimes too. That said, if someone is severely allergic to dairy (to the casein/protein), they may not be able to eat butter (making butter is kind of like the same concept as separating an egg and a tiny trace of the white can be stuck to the yolk—they take out the protein and lactose parts of the dairy and end up with just the fat…but there could be traces). Hopefully if someone has a super severe allergy, they’ll sub in coconut oil! Your blog has had me craving baked goods lately. You’ve been on a baking kick! After cutting out grains, you’re probably so happy to have found a way to get that chewy texture (which I find hard to replicate without grains.) I’ve never seen peanut flour anywhere for sale. the cookies look great, lisa! sadly, we cannot get pb flour in canada, to the best of my knowledge (see stephanie’s comment, below). i love how you are giving us these flour alternatives! i do not cook and i do not bake so my kitchen has not been used for those purposes in quite a while, haha! i do keep a full fridge, though!! i’m ok with pb cookies but they are not my favourite. nothing can beat chocolate chip (chewy not crispy!). yum!!! those cookies look awesome!!!!! i love peanut butter cookies anyway, so I can’t wait to try these out! I think I have been meaning to try peanut butter flour for about two years now. Julie at Julie Go Lean blogs about it ALL The TIME and I always want to try it! I have got to get online and order it. These cookies sound fantastic. And you’re right, cookies must be paired with something, and ice cream is always a good option! As I said on instagram- that filling looks amazing! Love PB anything . You could probably use PB2 pretty easily in this recipe. Week is going well. I made a good spaghetti squash mix and fried rice! I can almost smell those – yum. I wonder if that powdered PB is any cheaper than PB2. May have to check and see. OMG you are a grain, gluten and dairy free goddess!! These look amazing! I will be trying these soon!! I like to experiment with non traditional baking (gluten free, vegan, etc..) so these will fit perfectly into that. The frosting look amazing too. I think it’s great idea to keep the items separate. Then there will be no sogggggyness and each one will be as fresh as the last! Yep, those are the cookies I saw on twitter. They look awesome! And that seals the deal – I need to go grab some coconut flour asap. I LOVE peanut butter cookies but have actually only made them once or twice?? Not anytime recently! I’ve been looking for good organic peanut butter so maybe I’ll order the Once Again brand and give it a try! Haven’t made anything new in the kitchen lately, I was so busy this week, but hopefully I’ll get a little creative next week! I talked to someone at Once Again, and asked them about how they select peanuts….I’m always skeptical because I know peanuts can have a high mold/aflatoxin content, and most companies just balance out the peanuts with high mold into enough non-mold peanuts so they can get below the “legal” limit….Once Again doesn’t do that—when a batch of peanuts comes in, it is tested, and if it doesn’t meet standards, they reject it instead of spreading it into every batch as a cheap filler! So…they have been my #1 since I learned that! wow, so good to know that!! I love how you really are selective with the products you use and know what to look out for. Thanks for heads up! Now I’m definitely going to order some! I’m a bit confused. You don’t bake with almond flour but you bake with peanut flour/butter? The peanuts also has a large amount of PUFA/omega-6 that gets “rancid” with high temperature. Not that I personally care, but you seem very strict about not putting rancid oils/fats in your mouth.